June 13: What's On Today's Show : Blog Of The Nation In the first hour of Talk of the Nation, what's at stake in this economy, and the opinion page looks at the crackdown in Syria. In the second hour, Secretary of Education Arne Duncan answers questions about public education, No Child Left Behind and improving schools amid widespread budget cuts. Education Secretary Arne Duncan speaks during an "Ask, Listen, Learn: Kids And Alcohol Don't Mix" Event at Arlington Science Focus Elementary School on April 20, 2010 in Arlington, Virginia. Secretary Duncan joins host Neal Conan and a studio audience of students and teachers in today's second hour. The U.S. economy officially climbed out of recession two years ago this month, but many Americans still aren't feeling any recovery. The unemployment rate ticked up last month, the Dow continued a six-week slide last week and house prices have dropped to their lowest levels since the bubble burst. In spite of — or because of — the lousy economy, many business owners, hiring managers, workers and others are making important decisions about the future of their businesses and lives. Host Neal Conan speaks with New York Times' economics writer, David Leonhardt, about what's at stake in this economy. Syrian troops on Sunday attacked mutinous soldiers and other anti-government fighters with helicopters, tanks and heavy gunfire and regained control of a restive northwestern town. By some counts, more than 1,000 Syrians have died across the country since the government crackdown began, and some 10,000 others have been detained. Fouad Ajami, a senior fellow at the Hoover Institution, says Syria's brutal regime has now lost its false mask of moderation, and while the U.S. and others are beginning to apply more pressure, it may be too little, too late. Ajami joins host Neal Conan on the Opinion Page about his Wall Street Journal op-ed, Syria: Where Massacre Is a Family Tradition. 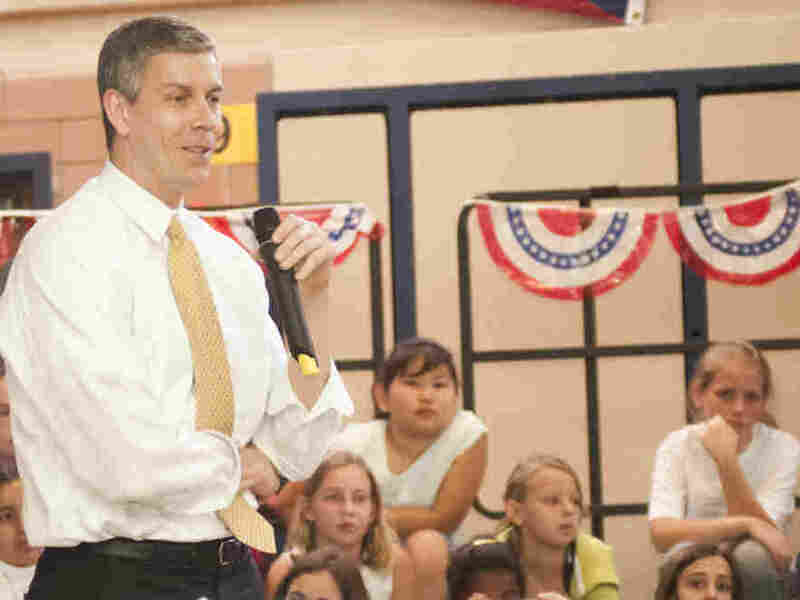 Secretary of Education Arne Duncan announced that he is prepared to bypass Congress and relax elements of the No Child Left Behind law if lawmakers do not rewrite the law before the start of the next school year. If the 2002 law, is not changed, 82 percent of U.S. schools could be labeled failures and face penalties. Secretary Duncan's "plan B" would waive some test score requirements and give schools more flexibility on how to spend federal dollars. As the school year draws to a close, Secretary Duncan returns for a conversation with host Neal Conan, and to answer questions from students, teachers and parents about changes in public education, the "No Child Left Behind" law and how to improve schools in the midst of widespread budget cuts.